A Canadian owl invasion? Now I’ve heard everything. Between birds being arrested and being invaded by aliens what could POSSIBLY be next? 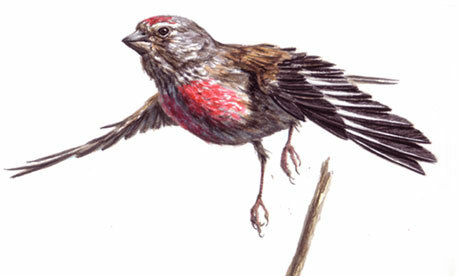 The Linnet in the U.S.? 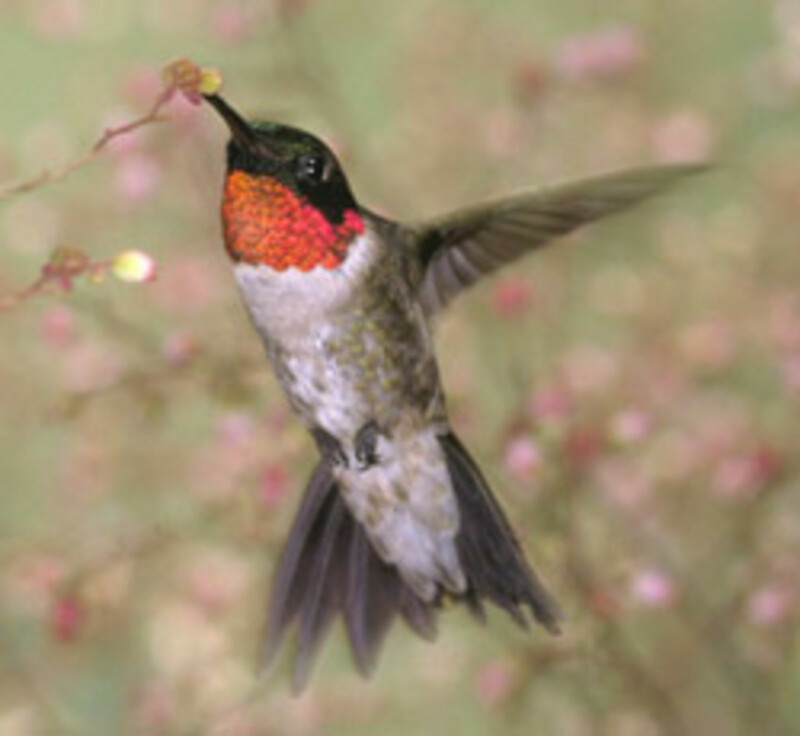 This is a must-see video from the American Bird Conservancy. This will enlighten, educate, and cause you to see birds in a different light. Please protect them, and keep the “wild” in wildlife. For Boomer Lake, December signifies many things. It is a period of solitude, tranquility, and sleep. With dormancy will come rest, and a time for future regeneration. This slumber is important for all living things, as it allows growth and a much needed stretch to allow us revitalization. 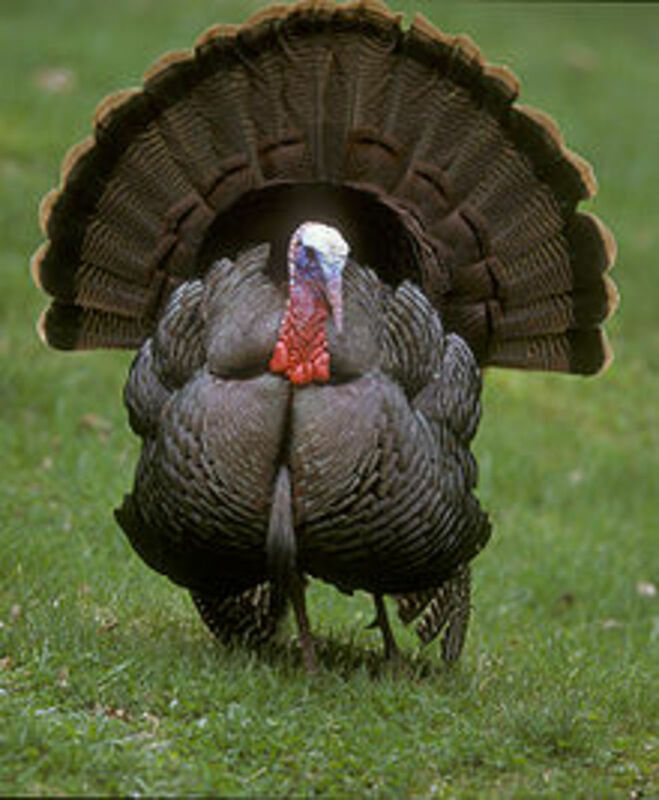 We are in a new season for wildlife, but many of our familiar birds still remain with us. Not all birds tend to migrate, even some diehards in certain species choose to remain in a year round home, like Mallards, Canada Geese, Northern Mockingbirds, and the American Robin, just to give a handful of our wonderful denizens here in central Oklahoma. For example, the robin just moves into the area neighborhoods where it tends to be a little warmer, yet others of that species will move elsewhere. There are many striking and beautiful birds on the lake proper right now, namely the Belted Kingfisher. This young lady was here last year, and gave me many photo opportunities. She has since found herself a mate, but she’ll return with him soon enough. Patience, now patience, and we might just get pictures of them skimming the water for small fish. 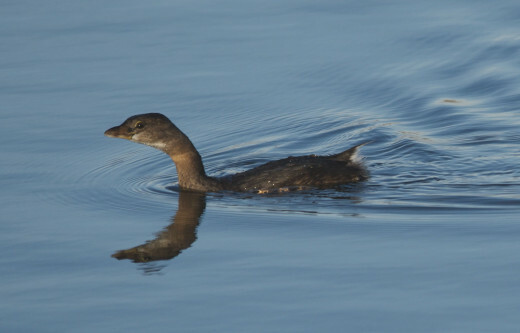 The Pied-billed Grebe is a gorgeous bird, whether or not it is in breeding plumage. 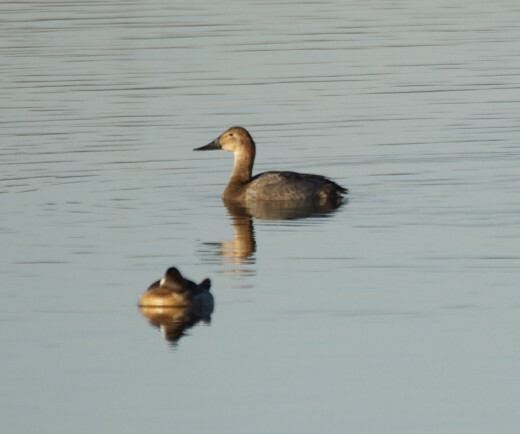 The grebe family is rather interesting, as they have air bladders that allow them to both raise and lower themselves in the water. This one is in the process of diving, which is how they obtain food. 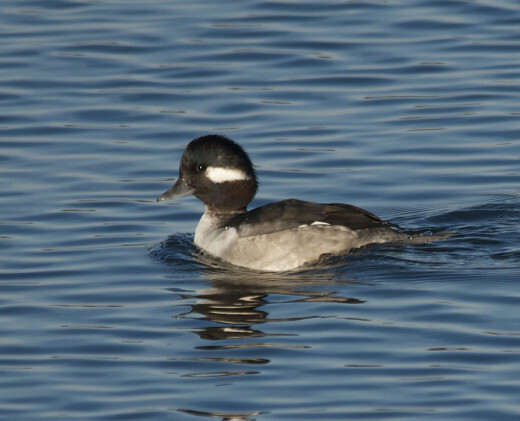 Here's some knowledge about the Bufflehead, including a photo of what the ducklings look like. 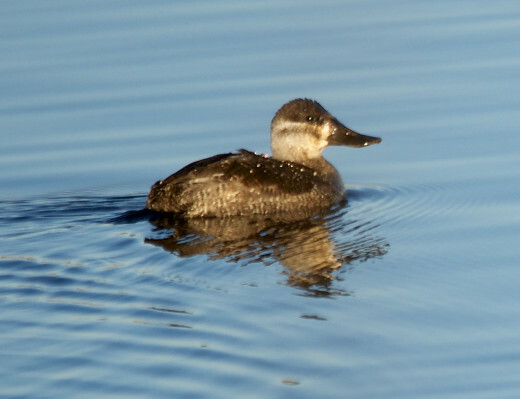 After viewing these photos, you will be able to recognize these gorgeous ducks, and be able to discern male from female readily. 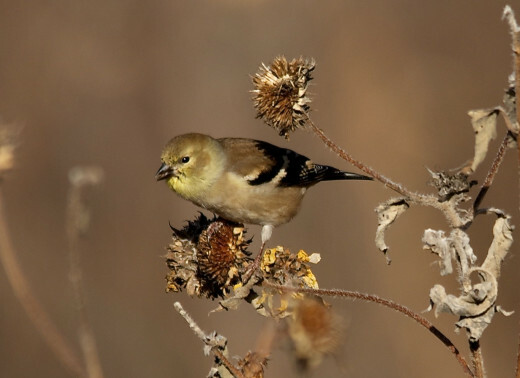 Here is a rare treat for those of you that admire the American Goldfinch. Finches adore thistle, and I happened to locate several while feeding. 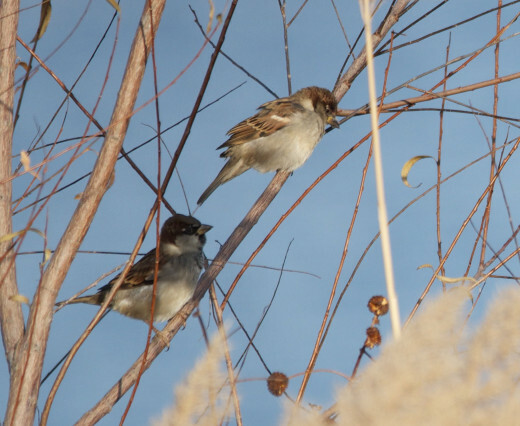 These birds coexist rather peacefully wile feeding, and there is no competition for food. As a matter of fact, they travel in small flocks in order to locate food for the good of the species, a commendable attribute. 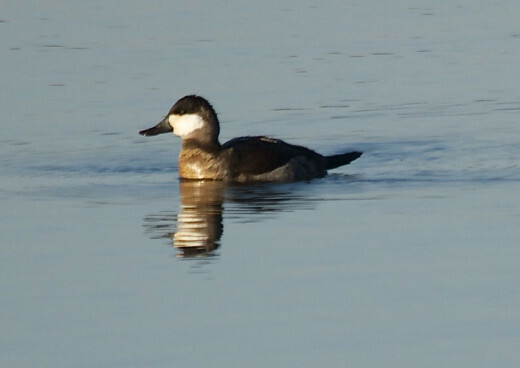 The Ruddy Ducks will soon be in breeding plumage, which is very unmistakable. The males will be sporting blue bills. They are stiff-tailed ducks, and the males also have white cheeks. 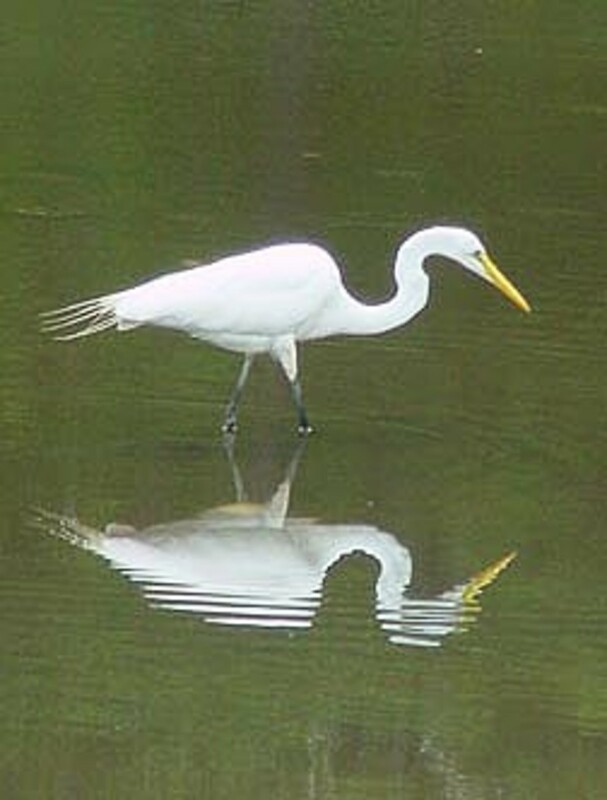 Their habitat includes lakes, freshwater marshes and ponds, as well as salt bays and harbors in the winter. If you leave near these particular areas, keep watch. You’ll not be disappointed with these beautiful ducks. 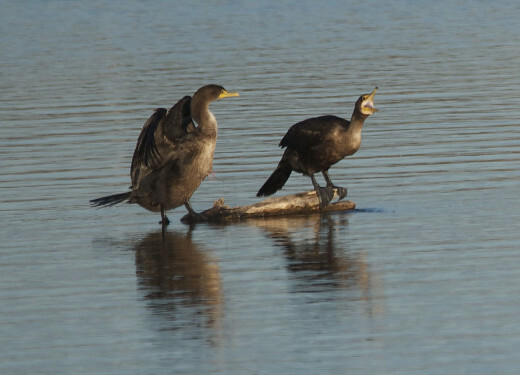 The Double-crested Cormorants are still out in full force, still managing to entertain me. 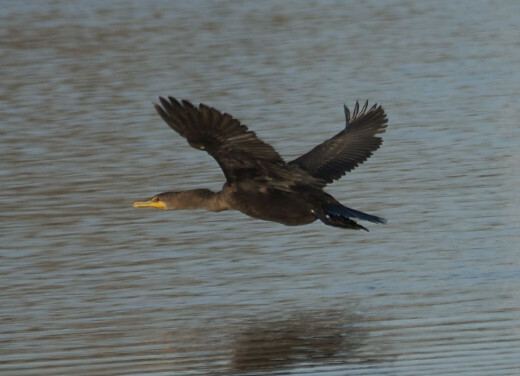 They are also known as shags in some parts of the country, so do become familiar with that nickname. Additionally these birds have no natural oils to keep their feathers dry, so they wil often be seen with their wet wings spread out in order to dry them off. 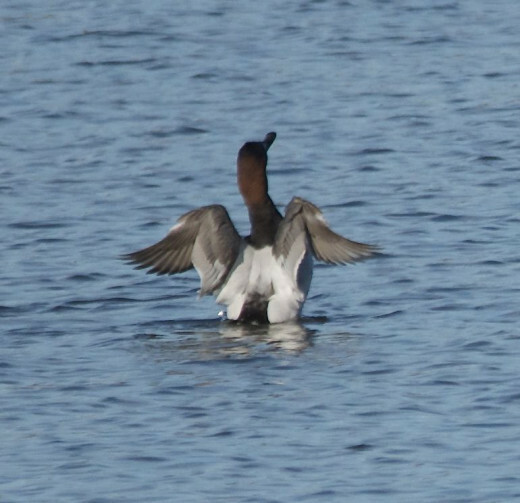 I saw the Canvasbacks for a couple of days, but they could have been on their way elsewhere, as it is a bit early. I expect more of them later this month, and I know I’ll not be disappointed. They are also very beautiful. The Red-breasted Mergansers don’t seem to be around any longer, and I’m also expecting the Hooded Merganser when it gets colder. These are gorgeous, and I’m very excited to obtained pictures of these wonderful ducks for you. The female always seems to have a perpetual bad hair day, but that makes her easy to locate. You’ll see what I mean soon enough. Keep your eyes to the ground, and your head in the clouds. We’ll talk more next week. Give me a heads up on your irruptive species(birds not normally seen in your respective areas.) Oh, by the way, chances are VERY good that you might come across some Snowy Owls, even if you’re quite far south. Good luck in spotting new species, and happy birding! Where Do I Find Deb's Boomer Lake? The weather has been off and on Deb. I was using my portable heater in my room at night in the second half of August - about the time of the mo. which I heard the geese during the day. Hey, Kevin! Back in August, eh? I have no doubt that happened. There have been a few night fliers around here recently, which is not uncommon, because some prefer to move at night(no predators). I read this and forgot tocomment on it before, sorry. I gave it thumbs up right away! I read the article about the owl but I did not get much from it. After a brief talk of the owl, they were talking about other birds. I had heard a couple flocks of geese fly over my house back in August!! Hey, Kim! I have heard that many Snowy Owls are here in the South, too. This is totally out of character, even for a normal irruptive year. Your photos are truly beautiful. You can tell they are taken with love. We have had a first sighting here in Niagara again of our illustrious snowy owl with reports of an additional four that had to be taken in for rehabilitation. Mary, chances are good that they like the swamp because it is quiet, and not frequented by disturbance. Many birds like the quiet, too, except for the little Belted Kingfisher and the notorious Northern Mockingbird. You have quite a selection of birds in your area, that's for sure. Thank you for sharing with us, especially your beautiful pictures. We have a pair of swans living in a nearby swamp. There is just no place to park a car or I'd get a picture to prove it. We have several lovely lakes and can't for the life of us figure out why they choose to live in this horrible swamp! Tirelesstraveler--Kingfishers are amazing. Not only are all of them gorgeous, they are quick. Yes, they do have bedheads, but never let that fool you regarding their grace and being right on target. Finally catching up on my birding. Those kingfishers crack me up. They look like they just got out of bed. I am learning as always, by reading your hubs. 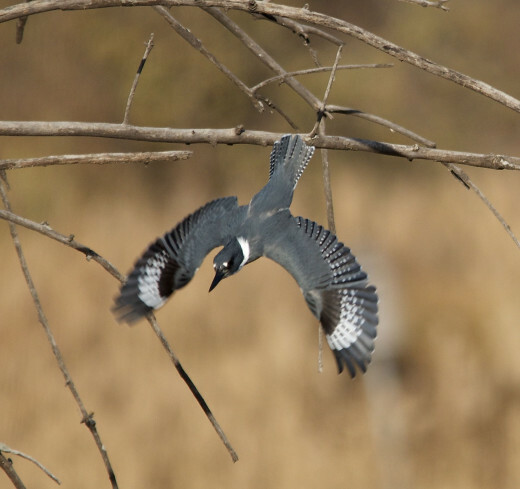 Your Belted Kingfisher in flight was amazing and I thought the Birds Rock video you included was really cool. If you saw a kingfisher, you'd know it. They're very fast, spin off the water for a fish, and they also have quite a trill during mating season. Geese will eat CONSTANTLY if you aren't careful. It really is best not to feed them, unless there is snow on the ground, and they really cannot get anything to eat. If you feed them, duck pellets from the feed store really are the most nutritious. No bread or other junk food is good. Hm I think I might be seeing Kingfishers, he looks awfully familiar. I was at the lake a couple days ago and all I saw were duck and geese and they came running like we had something for them and then when we didn't feed them they went around and stared at the front car door. Boy lots of ppl must be spoiling those guys. We aren't suppose to feed them of course and I don't although I hate to be begged, lol. The walked on our heals all along the lake, must have been hungry. Hey, Dave! I didn't realize that you had finch diseases in your area, too. I'll have to look into that. Thanks for the info. Hi Deb, another wonderful visit. Love the picture of the kingfisher diving. We have had problems with finch virus's over here in the last decade or so. It seems to have affected the Greenfinch more than other species. Your work is excelent as always. This is my first look at your work, and WOW, do you impress. 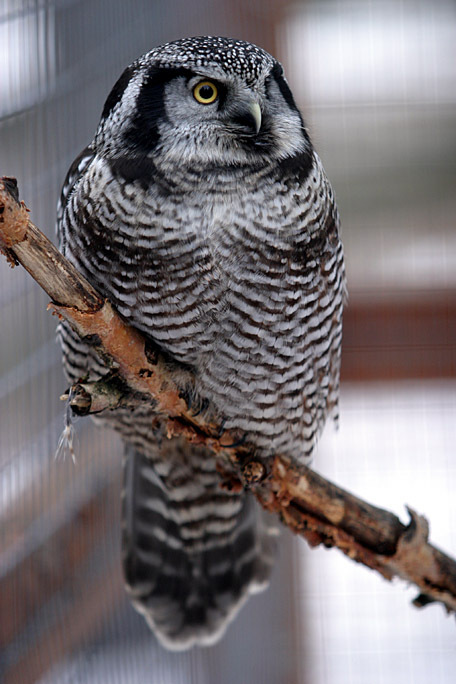 What a gorgeous portrait of that Hawk Owl. And all the information shows a lot of work. I'll be back for more definitely. Hey, Alicia! Glad that you enjoyed this week's column. Thanks for taking a walk on the wild side. This is another lovely, very interesting and very enjoyable hub in your Boomer Lake series, Deb. As others have said, the photo of the kingfisher in flight is impressive! Hey, Chris. The nice thing about this bird, is once they have been studied in motion, one knows how they move. They tend to dive, so I was ready. Hey, Nell! Thanks so much for letter me know what is in your area, and the votes. I appreciate your kind words. Hey, moonlike! Thanks so much for reading! My camera might be a little better than yours regarding the pics. I am able to choose my shutter speed for birds in flight, so that helps a lot. 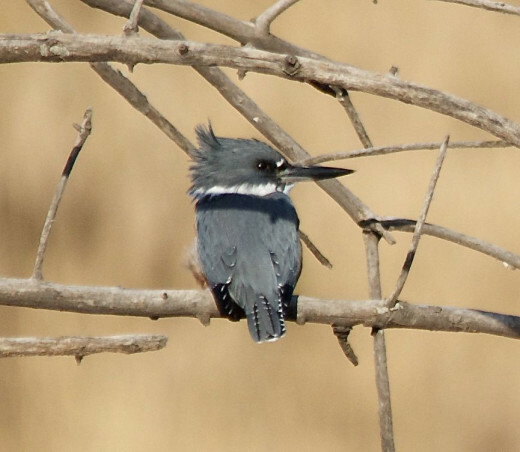 Deb, that final shot of the belted kingfisher is awesome. Great job. Hi Deb, another great hub about Boomer Lake, I love all the photos, there are hundreds of birds down here on the River Thames at the moment, its a winter thing, in the summer there are the usual amount but at this time of year there are thousands! Seagulls especially, inland for the warmth, or lack of it! lol! ducks swans and geese, its amazing! voted up! Sallybea, a good time to come here is in April, as it really is anywhere else when the birds are migrating, but this is definitely a hotspot. Thanks, deergha. Educating our world is the key to keeping wildlife safer. teaches, always look at finch eyes as a matter of record. Conjunctivitis will make them blind. It will also infect other birds and if you find it necessary to transport a bird so afflicted to a rehabber, wash your hands well and use betadine. Stunning imagery, just love the Kingfisher and the Hawk Owl. I would love to spend a lot of time at your Boomer Lake. I think I would feel as if I had died and gone to heaven! Very nice hub as always....Thank you for this one. Belted Kingfisher in Flight and all others including the you tube video are all very much awesome....as always....votes up and shared. Your photos always amaze me with their beauty. We saw a small finch the other day and it appeared to now even notice we were around. It just kept hopping on the ground in front of us. We thought it strange. Now I wonder if it had that diesease. I will have to keep an eye on this next time this happens. Thanks, Mel. Yes, you do. I need to know what is off the Pacific coast. Your. Kingfisher in flight was award winning. I have yet to see a Canvasback, although we do get the occasional Redhead here. I have to break out my binoculars and get out by the water. Great hub! Hey, Faith Reaper! More birds await you next week. Yes, Suhail, the goldfinches are rather small, and their favorite food is thistle. You should still find them quite available. Hey, Bill! Thanks as always, and keep me informed about what is in your back yard. If it weren't for those influx of Canadian owls, more mice would be in people's houses, silly! 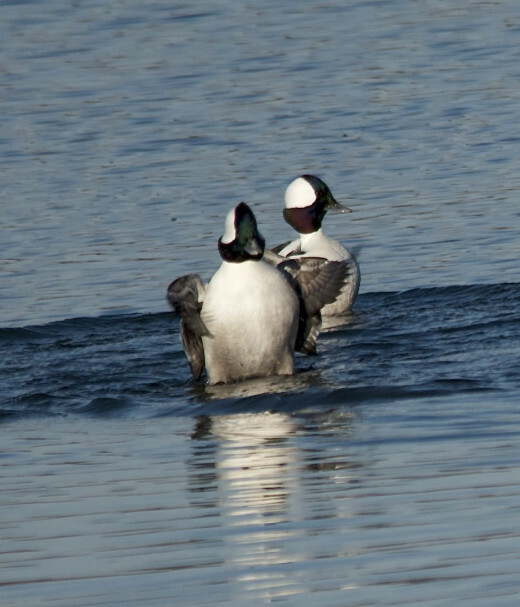 Wow, Deb, you really got some great shots there of beautiful birds, especially the Buffleheads! Thanks for continuing to educate us each week. Having a lovely week on Boomer Lake and I look forward to next week's hub! Well, what can I say more! It is always fun visiting your report of the week. It seems like I am practically counting the birds in OK myself. Aren't those goldfinches very small birds? I think I saw them feeding on the thistle till the end of October. I haven't hiked that much in November. Since weather has been mild here, I will try to find them during this weekend hike. Amazing photos Deb. Great job as usual. Have a great week. You americans - blaming everything on us poor downtrodden canadians..lol..
Love the last 2 pics, especially, Deb..i've never seen a commorant at all - never mind in flight! Love your work, you make it easy! Keep your eyes peeled, Connie. You're bound to see something out of the ordinary. I guarantee it. Hey, Linda! Glad to see you on the birding scene,too. You have been getting some pretty spectacular pics, yourself. And lots of interesting information, as well. Thank you for all your time, effort and care. L.
Thanks, Billy. It's always good to have you visit the lake and partake in the joys. I love the Birds Rock video. Thanks for including that here, and as always the pictures are exquisite. Well done once again my friend. You are so right, Wayne. Maybe people would notice more if they saw something different in their neighborhoods. Amazing work and photography, Deb. I think we could use a little more wildlife invasion.